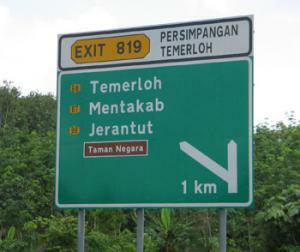 The quickest way to get to Taman Negara is via Jerantut. It's a 3-hour road journey from either Kuala Lumpur or Kuantan by East Coast Highway and exit at 819 toll Temerloh. There is another 59 km before you reach Jerantut. From Jerantut, drive all the way 67 km to Kuala Tahan. You may also take the public transportation from Pekeliling bus terminal in Kuala Lumpur (by monorail or STAR LRT you can drop at Titiwangsa Station in order to reach Pekeliling) or from Kuantan bus station to Jerantut. Our travel agency and guest house is centrally located in town, infront of taxi station and next to Ambank. It is in walking distance of restaurants, emporium, night market, bus station, train station, internet cafe, post office, banks and ATM. Note: The boats' departure from Kuala Tembeling is fixed at 9:00 a.m. and 2:00 p.m. daily.